India-Russia ties have been going through a rough patch in the last few years especially after India chose to upgrade its military and defence partnership with United States of America. It wouldn’t be wrong to say that a Siberian frost had descended upon Indo-Russian ties. Though both sides are trying for a thaw; it could be a while before the Siberian frost gives way to a Russian spring. For this India will need to reinvent its relationship with Russia which we elaborated upon in July 2016. While the diversification of Indo-Russian ties are yet from just defence to energy, nuclear power, agriculture, trade & industry, tourism is yet to be achieved the October 2018 summit between Russian President Vladimir Putin and Indian PM Narendra Modi in New Delhi is a strong step in a positive direction. 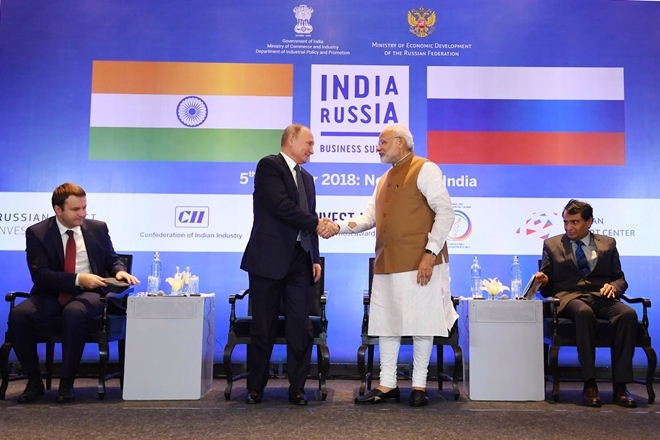 The annual Indo-Russian summit was more informal this year with no formal state reception or a personal receiving by PM Modi and like the previous ones under this administration since 2014 was less about Russo-Indian bonhomie and more on professional engagements between the two countries in various critical sectors. The joint statement issued by India-Russia clearly specified that both countries aim to increase bilateral trade to $30 billion by 2025 with increased co-operation in various sectors specially transport and industrial corridors where Russia could assist India in joint development. Significantly, the joint statement also laid emphasis on NSTC (North South Transport Corridor) and fast tracking customs and trade arrangements between India to Russia through Iran. The ambitious NSTC project could be further linked to BIMSTEC nations linking India’s north east to Myanmar and Thailand. The two sides also agreed to expedite the signing of a Free Trade Agreement between India and EEU (Eurasian Economic & Custom Union) pivoted by Russia. In the field of Energy, both sides further deepened their cooperation with Russia inviting Indian corporates to invest in Vankorneft and Taas-Yuryakh Neftegazodobycha along with the reciprocal participation of the PJSC Rosneft oil company in Essar Oil. Both countries also agreed to expand supplies of LNG & Gas with India’s GAIL & ONGC Videsh making active investments in Russia’s Far East gas fields. India and Russia also took stock of 6 new units coming up at the Kundakulum Nuclear Power Plant and a joint effort for Nuclear Power Plants in Bangladesh. While trade and energy were expected in the Indo-Russian joint statements, it was the Military-Defence co-operation which had the world watching- whether India would sign a deal for procuring the S-400 Triumf Surface to Air Missile Defence system. The S-400 SAM system is one of the most advanced missile defence shield in the world capable of taking down targets nearly 400 km away. India and Russia finally concluded the contract on S-400 SAM worth $5 billion that caused ripples not only in the neighborhood but even far away in Washington DC. The deployment of S-400 SAM systems on India’s western border would severely cripple the Pakistani Air force’s freedom to fly over its airspace, giving India substantial cover in case of a conflict between the two countries. The acquisition of 36 Rafales from France and S-400 from Russia plug the loophole in the depleting strength of Indian Airforce thereby securing its western front with Pakistan. However, it is important to note that apart from S-400 there was no mention of Fifth Generation Jet programme with Russia which has been nearly shelved now. Also conspicuously missing were any negotiations on Stealth Frigates, leasing a 2nd Nuclear Submarine and the Kamov K 226 military helicopter project which was agreed to in the previous summits. The fact that apart from S-400 TRIUMF SAM systems no other big ticket acquisition was signed or made a part of negotiations is indicative of the dynamics playing beneath the surface: the growing Indo-US Strategic Partnership with the signing of DTTI, LEMOA, COMCASA military agreements and the diversification of India’s military purchases from US, France and Israel. The Russians have been vocal about their displeasure about India buying Rafale jets from France (which their ambassador to India openly mocked in 2014) and have expressed dismay for India opting for US and Israeli military equipment. The real issue however has been US opposition to India signing the S-400 SAM deal with Russia, since it believes that this premium Russian technology is capable of taking down most advance jets like F-35 thus hurting US interests. USA has already sanctioned China for buying S-400 SAM and was also threatening to sanction India if it went ahead with the deal. However, since India is a strategic partner and pivotal player in Indo-Pacific, the Pentagon led by General Mattis actively lobbied for granting a special exemption to India thus allowing an amendment to CATSAA law which empowers the president to exempt any partner or an ally country from deals with Russian military and defence. While the amendment to CATSAA law was specially drafted to give waivers to countries like India, Indonesia and Vietnam for defence deals with Russia; whether those waivers are issued by White House solely depends upon discretion of the President Trump and the national security interests of USA. In all good sense we expect President Trump would issue a waiver for India on S-400 keeping in view the peculiar circumstances of Indo-Russian ties and the importance of India in US strategy to counter balance the growing Chinese hegemony in Indo-Pacific. Any sanctions imposed by US under CATSAA law would not only sour the growing partnership between the two countries but also jeopardize US strategy in Indo Pacific putting India back in the Russian orbit for its military needs. However, the US Administration may not be as benevolent on Oil imports from Iran post the imposition of sanctions from November 2018. It could be deduced that US pressure has weighed on India for curtailing large military acquisitions from Russia with S-400 being an exception to the same. Thus, it is incumbent on the Indian establishment to make a case for its strategic autonomy in defence purchases while deepening its co-operation with US and its allies for its security interests in Indo-Pacific. India’s emphasis on Russia as a strategic partner is not just about defence and old ties but also the realities about the weight Russia holds in international forums. Though Russia has been widely sanctioned by western countries, it remains a P5 power with one of the largest militaries in the world and some of the most advanced weapon systems. Russia is thus critical for India to maintain balance on multi-lateral forums like BRICS, SCO, UN, NSG and other global governing bodies where India desires a rightful place. Russia is also bound to play a critical role vis-a-vis China who has deepened military and economic co-operation with Russia in wake of US and European sanctions post Crimea invasion of 2014. India’s strategic interests demand a good and healthy relationship with Russia to counter balance China and China’s deepening relationship with arch-rival Pakistan. Russia is a critical player in the Central Asian region, especially Iran and Afghanistan where India has heavily invested in Infrastructure, connectivity through rail and ports like Chabahar and the much touted NSTC corridor between India, Iran and Russia. When Iran is sanctioned again in November and US pressurizes India on Oil imports, Russia could very well decide the fate of the region if it chooses to back its ally, Iran in the Persian Gulf giving India greater flexibility over its bargaining power with US. India could also leverage its ties with Russia to make sure any Taliban resurgence doesn’t spillover near its borders or CIS states. Thus there are vast areas of convergence between India and Russia from nuclear energy to space missions to defence deals and geopolitical conflict zones in the Middle East and Central Asia. However, with the growing Indo-US bonhomie and emerging bi-polarity between US and China as result of a Trade War, India’s strategy of multilateralism may need a reality check and possibly a tweak for realpolitik. It is here that India’s real test lies as to how well it can maneuver the fast changing geopolitical dynamics in Indo-Pacific and yet maintain its strategic partnership with Russia. Though Indo-US Partnership is the future of Indo-Pacific critical to the regional and global order; India’s strategic partnership with Russia will in actuality boost its stakes in the game and is indeed a big plus to India’s options at the global stage.